The electrical discharge machining services we offer at Enterprise can be used to produce precision single piece or low volume components for a variety of applications. The project highlighted here consisted of the machining of an internal spline that was used in an overhead crane by a customer in the new equipment industry. The spline is constructed of R4140-HT chrome-moly steel with an outer diameter of 11.811”, an inner diameter of 10.770”, and a length of 13.625”. This customer is local who called on us to perform their post manufacturing machining work. EDM processes are ideal for many post-manufacturing applications because they provide the ability to perform precision machining on hardened metals. For this project, dimensional tolerances as tight as ±0.0005” was held at critical locations. This was a rush order for a single piece that was completed in two days. As a result of our responsiveness and quality of work on this project, the customer has contacted us regarding several additional machining projects. 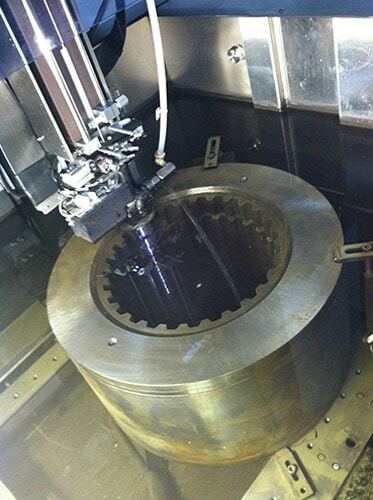 For additional information about this custom wire EDM machining project, see the table below, or contact us directly. Have a project that you need done? Contact us to request a free quote!